Reigning national cyclocross champs Lisa Jacobs and Allan Iacuone lead the 2014 series after Melbourne’s opening rounds on 21-22 June. 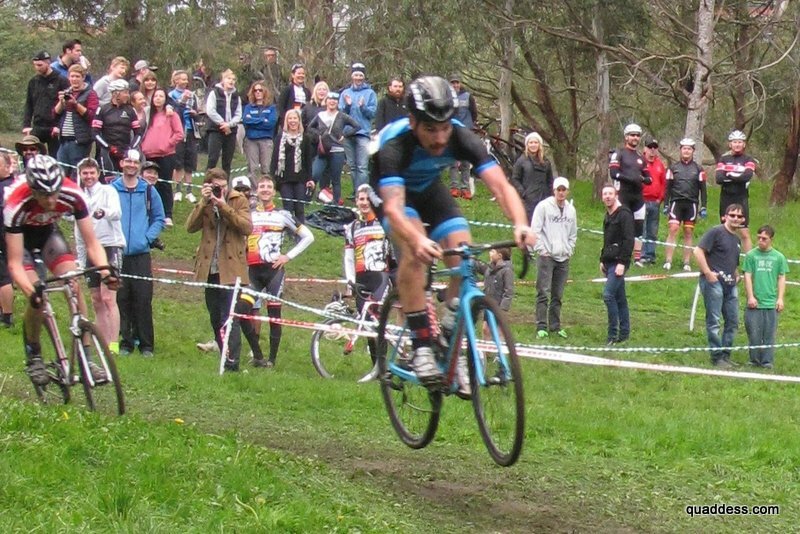 Round one featured the Victorian championships at Cranwell Park, but the weekend wrapped up with the usual noise and laughs at Darebin Parklands on Sunday, hosted by Dirty Deeds CX. Sunday’s course had little mud but plenty of slippery grass, climbing and big fields with over 320 riders. 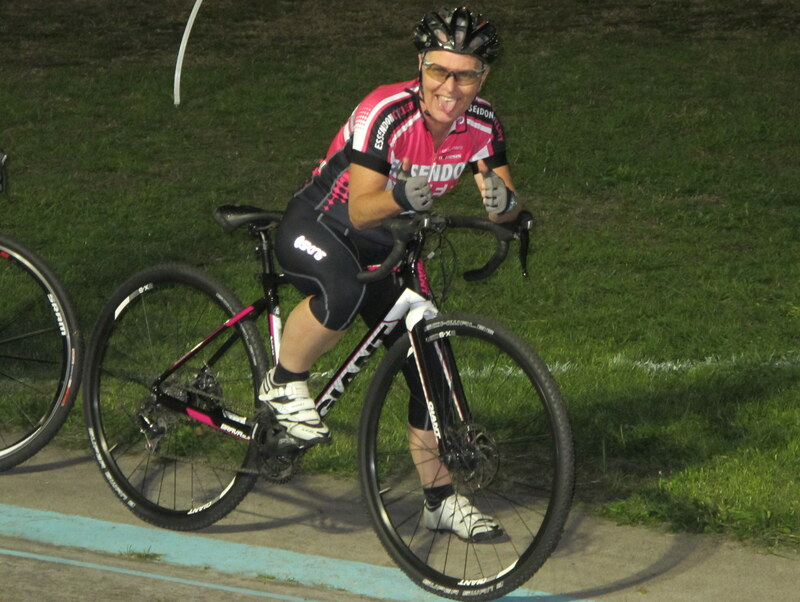 Dirty Deeds Cyclocross turned Good Friday into #bestfriday with its annual twilight prologue to open the Melbourne cx season at Brunswick velodrome. Early showers cleared for dry racing in the infield under lights, as hot laps gave way to kids and 10-lappers for the women and men, before the finale of three-lap giggles shootout handicapped by height. Love it. There was food, laughs, great commentary, noise and coffee as the sun went down, but good racing too. Amity McSwan dominated the women, seemingly faster every lap to finish clear of Phillipa Birch. Third was new Jayco VIS recruit Tessa Fabry, who had barely warmed down from topping the A grade podium at Hawthorn Cycling Club’s Good Friday crits (and recent top results in the National Road Series). Men’s A was on from the gun, with crowd-sourced holeshot cash snatched by reigning UCI Cross Country Eliminator world champ Paul van der Ploeg – a #vanderholeshot! Vandy and national cyclocross champ Allan Iacuone diced for the lead for several laps until split by young Liam Jeffries. Keep an ear out for victor van der Ploeg at the UCI World Cup in Cairns next week. Pro results live on the night and now at metarace. 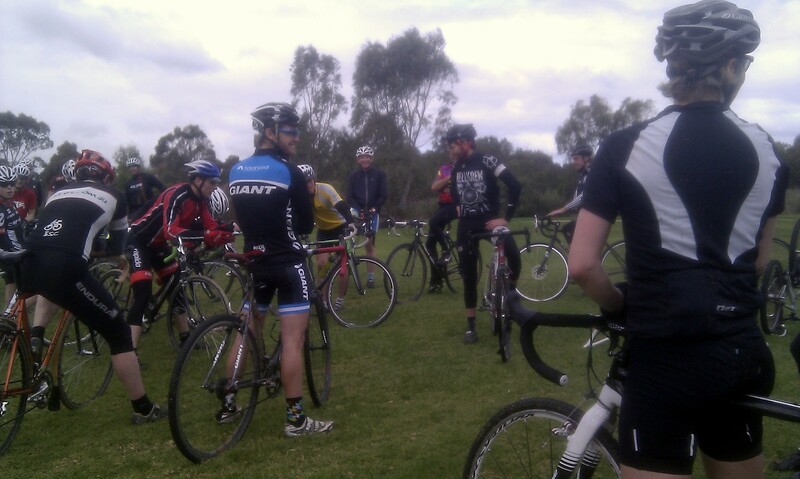 Hawthorn’s crits at the teardrop circuit in Kew was another first for Good Friday. All entry fees, and from what we hear most of the prize money, was donated to the Royal Children’s Hospital Good Friday Appeal. The crits scored a live cross in Channel 7’s annual appeal’s fundraising telethon. Nice work Hawthorn! Good Friday has definitely turned into #bestfriday. How many national titles here? More pix here, by baudman. Cyclocross doesn’t get much more exciting than today. Our first national team races at the UCI World Championships in Hoogerheide this weekend and it includes two chicks! Who would have imagined that three years ago? Local crowd fave Lewis Rattray represented in 2012 in his usual crowd-pleasing style but 2014 sees our first national team. CX has a long history in Europe and it’s strong in north America but it’s not even four years since the Dirty Deeds CX crew started ‘getting riders muddy and smiling’ in Melbourne in 2010. They followed up bigger and better in 2011, which also brought a winter series to Port Adelaide CC. And then a summer series. Back home we scored a Vic Open. By 2012 we had regs and a national series raced in Melbourne, Sydney and Adelaide (with equal prizemoney!) thanks to lots of work by DDCX, PACC and in NSW, Manly Warringah MTB, plus support and goodwill from the state and national bodies. The 2012 Adelaide courses are still my favourites; they made my bike so very happy. The action starts Saturday morning (Dutch time) with Junior Men, followed in the afternoon by the Elite Women. Local hero Marianne Vos will be lining up against World Cup champ Katie Compton, along with Sanne Cant, Helen Wyman, Nikki Harris, Aussies Jacobs and ‘smiling assassin’ Anset and the rest of the world’s best. If you’re not staying up, you’ll find full replays at those links later. For those new to the cyclocross party, Lisa Jacobs won the 2012 inaugural national women’s elite cx series and backed up with the 2013 inaugural women’s elite cx championship. She’s an ex-full time roadie, still with the Victorian Institute of Sport. There’s an insight to her worlds preparation here. Mel Anset took silver in the 2012 national series, winning the final two races in Sydney. She was the clear winner in round five on the Saturday, but had to hold her nerve for an hour error-free as Jacobs worried her wheel all race on the Sunday. There’s a good piece on her road to the worlds here. 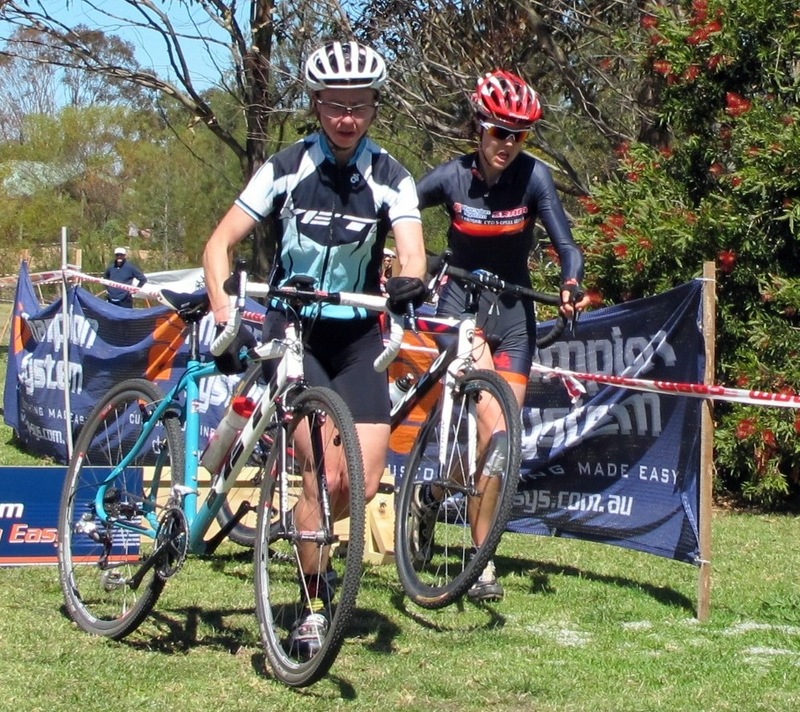 That same Sydney weekend (the only cyclocross series with sunscreen?) also produced moments that start to build our local folklore as Tasmanian mountain biker Sid Taberlay – fresh from Cross Vegas – rode the ‘unrideable’ death pit each lap. Mountain biker Adrian Jackson won that inaugural elite men’s series from Lewis Rattray. In 2013, the elite women also raced to the wire, with the title decided only in the final minutes of the final race, as Rowena Fry finished fourth to win the series from Sarah Holmes, with Anset in third. Paul Van Der Ploeg terrified the barriers to take the 2013 men’s elite series from Adrian Jackson, while Allan Iacuone won the 2013 national cx championship – 19 years after his national road championship. You couldn’t script this stuff. Over time, we’ve seen the national rounds become more serious and pros and ex-pros like Iacuone and Danny Hennessy lured from retirement for spectator pleasure: Robbie McEwen rode a couple of national races last year and loved it, and track star Anna Meares swapped the boards for Adelaide’s grass and dirt in her post-Olympics down-time. But there’s still lots of laughs and pain to be had at the back of the nationals races, and in club events. Hope you enjoy cx worlds. Best of luck to all the Aussies, especially Mel and Lisa. And if you think it looks like fun, think about dusting off a beater or beating a cow bell in a park or a paddock near you this winter. 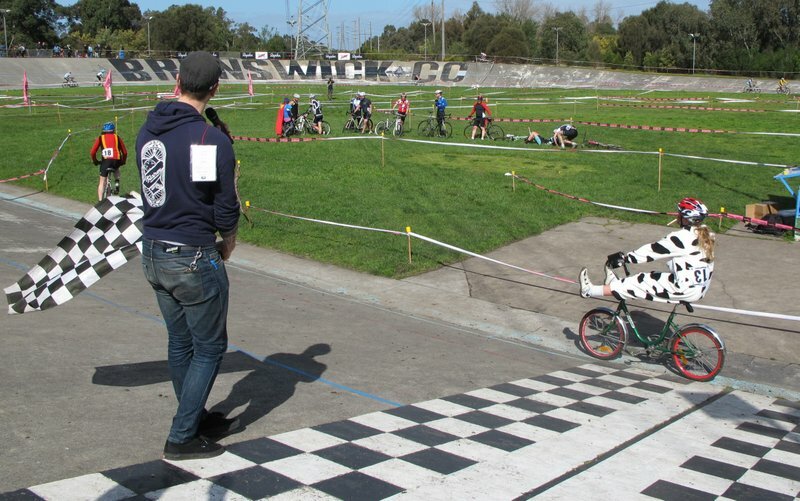 Melbourne’s Dirty Deeds Cyclocross faithful wrapped up the 2013 season with Spooky Cross at Brunswick velodrome yesterday. With the regs officially laid to rest, the short course format meant everyone could race their divisions twice, plus a relay and hot lap before the featured Brunswick Cycling Club DDCX Single Speed CX World Championships. Competition was fierce for the hot lap which eventually went to 2013 national men’s CX champ Allan Iacuone from Jeremy Soawyer and Lewis Rattray in new aero kit. And as twilight fell and the Survivor flares led the way, Tessa Fabry and Duncan Murray were crowned BCCDDCXSSCX World Champs. The kids’ race and costumes were as popular as ever but the relay changeovers and on-course hand-up station took it up a notch this year. Thanks to the DDCX crew, spectators and racers, Spooky Cross easily takes the rainbow stripes for funnest racing all year. Very pro results over here. And the crowd went ooohhhh …. Is there anything more fun than riding cyclocross? Besides watching cyclocross? 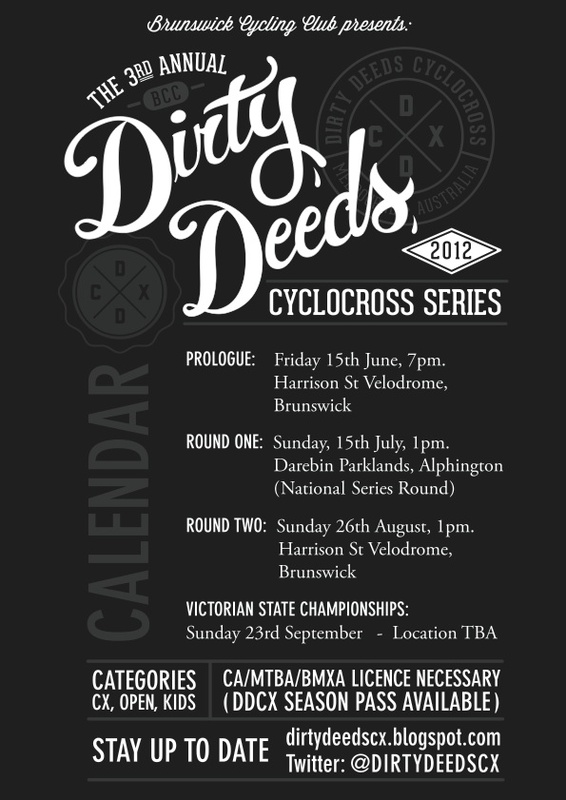 Dirty Deeds CX recaptured the fun of earlier days with its Rapha Supercross round at Brunswick velodrome on August 26. The kids set the standard with both face paint and costumes, followed by ‘any bikes’ and the B grade men who chopped up the course nicely. 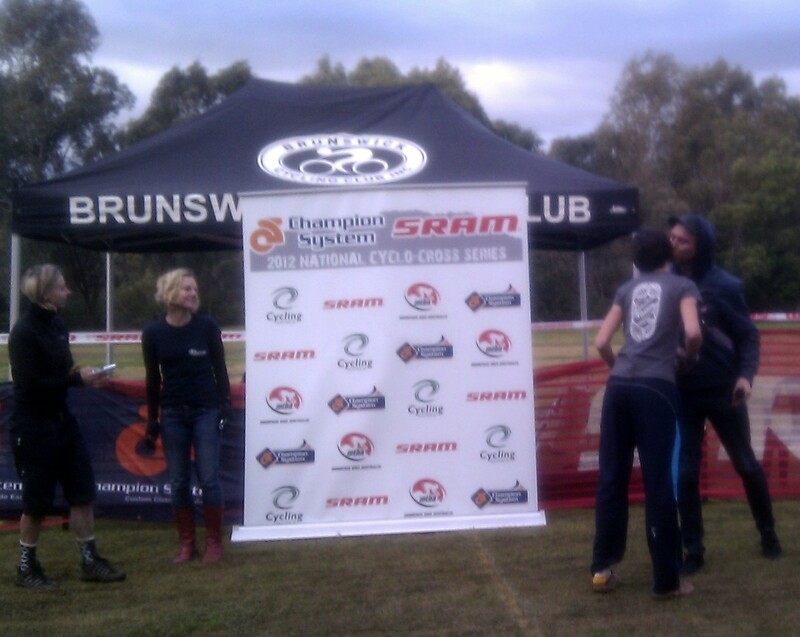 Melbourne’s second round of the Champion System SRAM 2012 National Cyclocross Series is done and dusted, with the Dirty Deeds Cx round at Darebin today. A flowing course, good organisation and plenty of noise at the mudpit made for a fun afternoon. A kiss for Round 2 national series women’s elite winner Lisa Jacobs. She’s fast! Podium boy, yeah? You’d be hard pressed to find more laughs on a cold winter night than the Dirty Deeds Cyclocross prologue on Friday. Maybe it’s just cyclists, or the commentary and cowbells. Or perhaps the occasional beer. 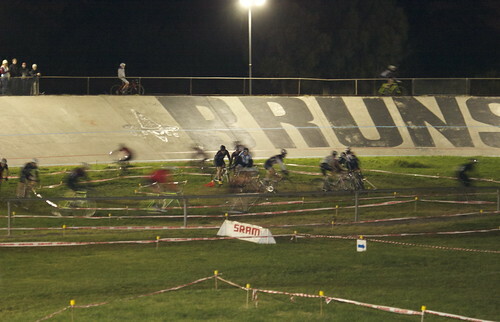 Either way, Brunswick velodrome saw a huge crowd as over 140 riders mashed the infield for two hours, resplendent with the awesome Spiral of Death. The DDCX Spiral of Death, courtesy baudman. Yesterday saw my second episode of ‘cages on, cages off’ for the year – otherwise known as cx skills practice coming up to bruise season. The Dirty Deeds Cyclocross gang ran a women’s skills session in April and a unisex session yesterday, with tips from the DDCX crew and Lewis Rattray (cx world cups and world champs). The sun was out and riders were happily playing in the park, refining dismounts, remounts, barrier clearing (mostly) and shouldering (hence cages off), followed by tyre pressure talk. Of course bruise season also means it’s time to start buying lottery tickets again, in aid of a lighter, dedicated cross bike so I can leave the cages off most of the time.